NIGEL JAMIESON’S GALLIPOLI BEGINS, APPROPRIATELY ENOUGH, WITH A DRILL. THE MASSED COMPANY, 35 ACTORS STRONG, ENTER IN KHAKI AND STAND CRISPLY BEFORE US. A SERGEANT SHOUTS THEM THROUGH THEIR FORMAL PACES—STANDING AT ATTENTION, BRINGING RIFLES TO BEAR, PRESENTING ARMS. LIKE ALL OF THE PHYSICAL SEQUENCES THROUGHOUT GALLIPOLI (MOVEMENT DIRECTOR GAVIN ROBBINS), THIS IS A WELL-EXECUTED PERFORMANCE, A FINE DEMONSTRATION OF THE SKILLS AND COMMITMENT OF THE STC ACTORS COMPANY AUGMENTED BY THE THIRD-YEAR ACTORS FROM NIDA. THEY BEGIN TO MARCH OFFSTAGE, AND IMMEDIATELY THE DYING BEGINS. Gallipoli has many highlights, including a history lesson about the start of World War I that plays the complex configuring of alliances as an ever-escalating comic vaudeville. The company powerfully outlines the War Precautions Act (1914), which outlawed any negative reportage of Australia’s role in the conflict. A nurse recounts the visceral horror of the woefully inadequate hospital ship, struggling and failing to treat 8,000 wounded with only 350 beds. In moments like these, Gallipoli excels. As a whole however, the work struggles for focus. Attempting, in a seemingly endless succession of short scenes, to offer multiple perspectives on the conflict and draw attention to the complexity of the story and its mythologising, the effect over its almost three-hour duration is numbing rather than illuminating. Spreading the narrative web extremely widely, Gallipoli fails to follow any perspective closely enough to effectively shape the work’s drama. The sole exception to this is the story of General Sir Ian Hamilton, engagingly portrayed by John Gaden, whose journey is traced from a recall from retirement to commanding the assault, to being removed from command as the primary scapegoat for the failure of the campaign. Despite initial misgivings, especially about the resources allocated him, Hamilton becomes increasingly excited by the challenge of the campaign, convincing himself and his staff that despite all of their limited resources, untested tactics, adverse circumstances and non-existent battlefield intelligence, the battle will be a glorious endeavour. “Before us lies an adventure, an adventure unparalleled in modern war”, he declares to a general staff briefing on the eve of the landing. It’s a clearly self-deluded position, but nonetheless Gaden’s Hamilton is a remarkably sympathetic figure, and Gallipoli feels stronger whenever he appears. Thankless in comparison is the role of war correspondent and later war official historian Charles Bean, effectively portrayed by Luke Mullins. Initially instructed to produce reportage that was in fact propaganda, to help sell the war at home by delivering good stories of heroic Australian forces in action, Bean wrestles at various moments with the stupidities and horrors he witnesses, and the compromises he is forced to make in order to sanitise the slaughter for domestic consumption. At times it feels as if Bean is supposed to be the primary narrator, but his frequent absences from the stage make this untenable. Strangely, the hero of the piece arrives in the last half hour in the form of Sir Keith Murdoch (Eden Falk), the man who, according to his son, “may not have always told the truth, but changed the course of history.” The narrative white knight Murdoch bursts onto the stage in a beige suit, a dynamic figure cutting through the official secrecy around the campaign and publicly naming the disaster for what it is. His letter to both the Australian and British Prime Ministers has immediate impact, with General Hamilton recalled and the surviving forces evacuated from the peninsula. After a couple of hours witnessing Charles Bean reluctantly self-censoring his reportage to comply with the will of the State, Murdoch’s demonstration of the power of the radically independent press is striking. 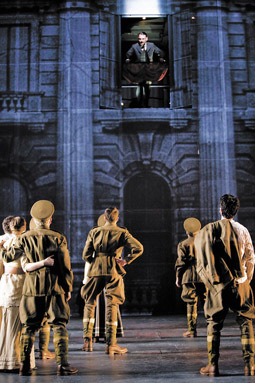 The technical skills of the creative team are aptly displayed throughout Gallipoli, especially the evocative video (Antonia Fredman), highly adaptive design (Brad Clark, Alexandra Sommer and Nigel Jamieson), and daring aerial work (rigger Finton Mahony). Nevertheless, it feels like most of the content of this Gallipoli has been told too many times, demonstrating what former US Secretary of Defence Donald Rumsfeld once described as “the known knowns.” In approaching this complex, multi-faceted national story, Jamieson has tried to tell too much, and the sheer mass of material precludes deep analysis. If perhaps an hour of material were stripped away, including many of the music hall interludes and frequently repeated songs scattered throughout the performance, Gallipoli would be a thrillingly visceral experience. As it stands however, it’s a meandering, yet artfully realised spectacle, the first draft of a significant theatrical work.